A good bot-worm control program includes eliminating bot eggs from your horse. The Bot Egg Knife's special shape is designed to reach into crevices where bot eggs are found. Bot Egg Knife is rated 4.6 out of 5 by 34. Rated 5 out of 5 by Chrissy S from Great knife I've not had any issues with this knife. 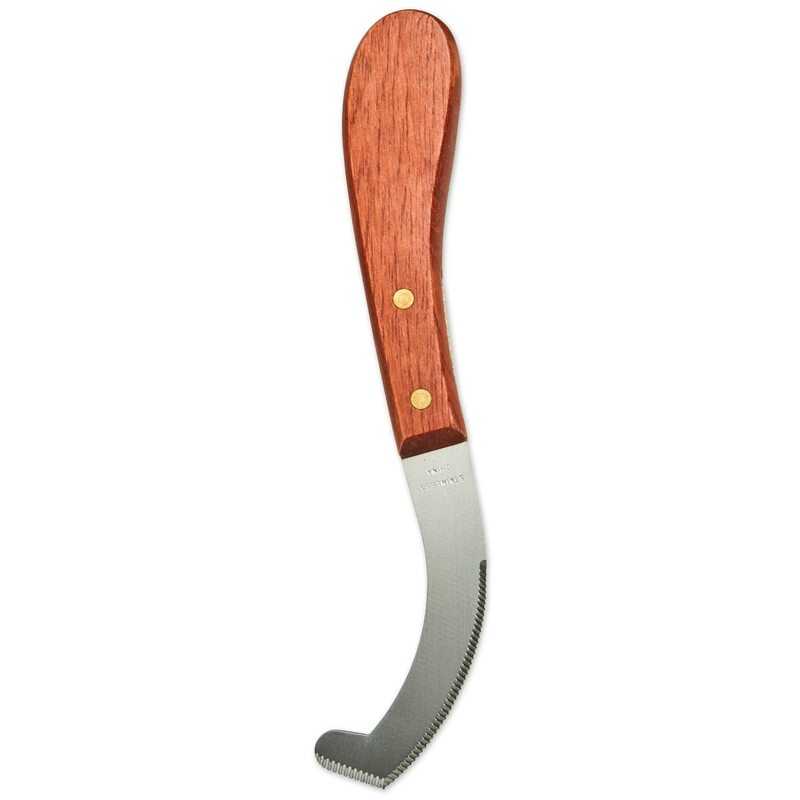 A sharp blade with cover over it and comes with a solid, wooden handle. This is a right handed knife. Works great! Rated 5 out of 5 by Newottbmom from Works well! Great knife for a good price. Love that it has 2 different edges for those hard to reach angles! Rated 5 out of 5 by Christie0507 from Great product! This has a very sturdy handle that is easy to hold. The blade easily gets the bot eggs off even in the hard to reach and bony spots. Rated 5 out of 5 by boots75 from worked great and easy to use my daughter and myself were happy to use. Rated 4 out of 5 by Cadkins123 from Works Pretty Good! So far it works fairly well but still have a hard time removing the bot eggs. Rated 5 out of 5 by Alyx from Worked perfectly! It worked great!! Super easy to use and cured the problem first time! Rated 5 out of 5 by Peyton804 from Solid Wanted one with a wooden handle but this one is just as good if not better!! Rated 5 out of 5 by fussyhorsemom from Excellent quality. Nice wooden handle, and sharp blade. Much better quality than I expected for the price. And works much better than my old bot knife that's been used to cut open hay bales. Rated 5 out of 5 by TDDD from Perfect knife I love this bot egg knife. It works perfectly, removes the eggs quickly and efficiently and I love the broad wooden handle for easy grip. Rated 5 out of 5 by Ray23 from Does its job It's a bot fly knife, and it works. Have only used it for a few weeks, but seems fairly durable, works better than a grooming/pumice stone.